The Xerox Duplex Travel Scanner scans without the need of AC power because it is powered through the USB port. Now you can quickly scan, file and store all of your documents, plastic ID cards, photos, articles and brochures no matter where you are. Compact, Portable and Powerful. 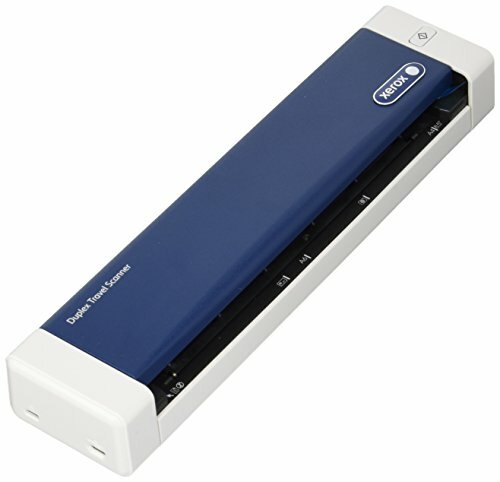 Weighing a little more than a small bottle of water, the Xerox Duplex Travel Scanner includes robust PC and Mac TWAIN drivers, and scans cards as small as 38 mm (1.5"") and documents up to 216 mm (8.5"") wide and 813 mm (32"") long. Xerox Duplex Travel Scanner includes a powerful suite of bundled software for Windows PC, designed to help you organise your documents and easily find the information that's on them. The bundle includes Nuance PaperPort, the industry's leading desktop document management software, plus Nuance OmniPage, Nuance Power PDF, Visioneer OneTouch, Visioneer Acuity, TWAIN, and WIA drivers. And for Mac, the most fully featured TWAIN driver in the market today, ICA support, and a simple yet powerful Scan Utility, allowing you to get started right out the box.